When people start their weight loss journey they often set themselves unrealistic goals and consume insufficient food and over do the cardio. Weight loss is a marathon, not a sprint. Create good habits. 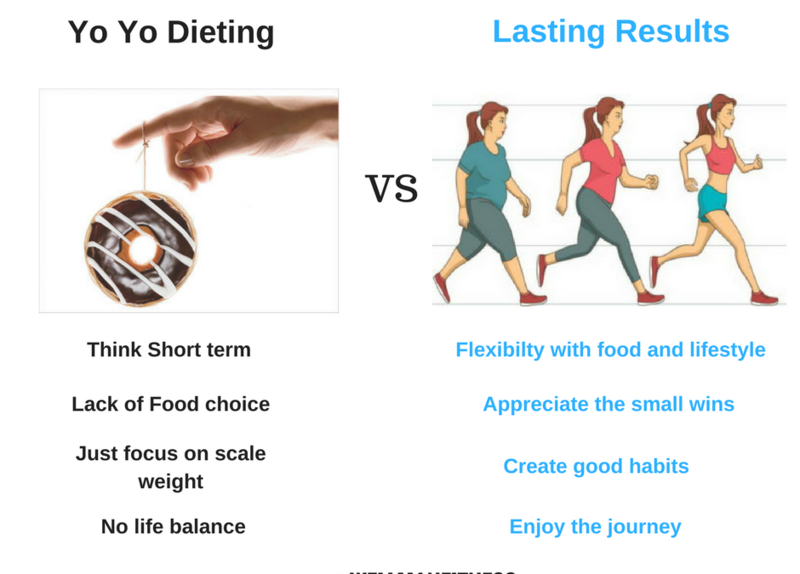 The goal is to create a lifestyle that involves sustainable eating and exercise, behaviours that you can do day in, day out, not just for 12 weeks. Create flexibility. The goal is not to set too many strict boundaries but to implement a realistic approach. Obsessing about eating every meal, never missing a workout and weighing everything can create obsessive behaviour and a love/hate relationship with food and the gym. Consistency, not perfection. These are all signs that you are moving forward and getting one step closer to your goal, ‘Rome was not built in a day’. Enjoy the journey. Find a strategy that works for you, for example, consider the type of exercise you enjoy and look for a way you can incorporate some of your foods into your day. There are many different ways to lead a healthy lifestyle, find out what works for you. If you enjoy the process, you are more likely to be consistent and reach your end goal.